The first step to kayaking the L.A. River, and perhaps the toughest, is finding it. 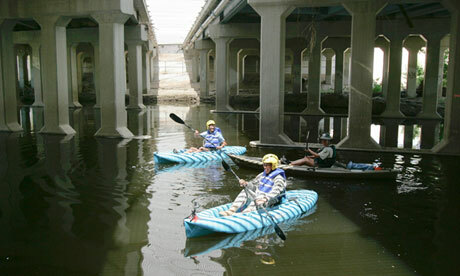 Rory Carroll, a reporter for The Guardian, took on that challenge, eventually meeting up with the intrepid group LA River Expeditions to navigate the concrete channel. This is the group’s inaugural season on the river, and George Wolfe, the founder of LA River Expeditions, hopes that the kayak tours are the first step to changing the community’s perception of the river. “We have to start thinking in new ways, and using words differently. If you call it a sewer ditch you treat it like a sewer ditch. Call it a river and you treat it like a river,” Wolfe says.